"Hi, Jim some pictures of the 49 scout you helped me with..
Bike, thanks again,Bike runs great, starts first kick (most of the time) hot or cold, great to be on the road again. "Jim, here are some pics of my 49 you have been helping me with. I just mocked everything up for the pics, I will need to wire it and bolt every thing down. 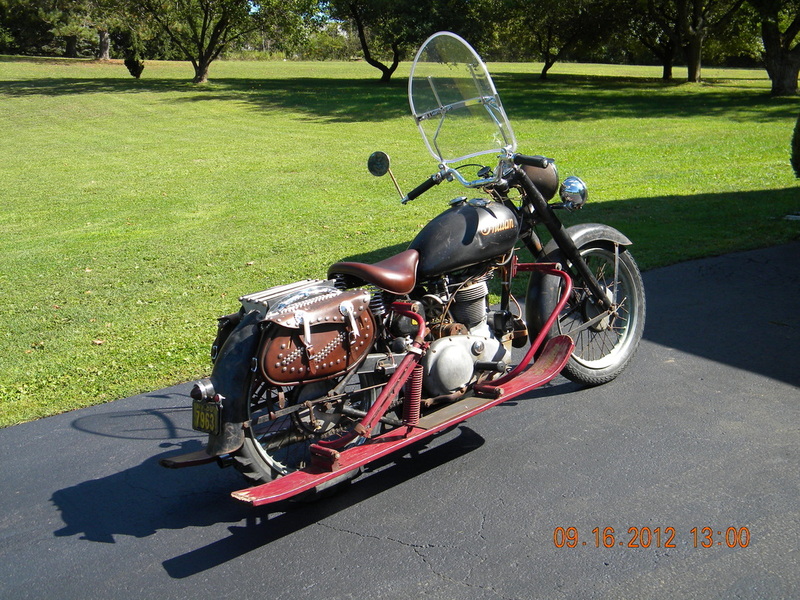 Thanks Jeff Allison Herculaneum, MO "
I have owned and ridden a 1950 Arrow since 1972 when I got out of the Navy. I used to hang out at Don's Cycle Service in Warwick, RI, the last Indian dealer in the state. I learned a lot working with Don. A few years ago I had the magneto rebuiolt by http://www.mainelymagnetos.com/magnetos.html. They did a wonderful job, and now the bike starts and runs as well on the mag as it did on the external coil I had to run for years after the mag quit. Anyway, it is always great to find another source of parts. Attached is a picture of my Arrow. It has the optional buddy seat. Don told me it was an original option and was quite rare. I have had to recover the seat. Here is a picture of the bike. We added the skis and the original rear tire that was used when the skis were installed. You don`t see very many Vertical Indian with this option. Still working on it but it is coming along. Thank you. Mark. "Hi, Jim some pictures of the 49 scout you helped me with. Hi, this is the first day of sun shine this year, Just wanted to show you what you have been good enough to help me finish with this Bike, thanks again, Bike runs great, starts first kick (most of the time) hot or cold, great to be on the road again.